The European gypsy moth was introduced into this country in 1869 and occurs generally throughout most of the Northeastern United States and adjacent Canada. During favorable conditions for the gypsy moth, outbreaks may appear suddenly and may continue for two to five years in any one location. Natural control factors such as starvation, disease, parasites and predators eventually combine to bring about a collapse of these outbreaks. A fungal disease, Entomophaga maimaiga, is responsible for keeping populations below noticeable levels most years. Adequate early growing season moisture (May-June rain) is necessary for the disease to be effective in suppressing gypsy moth populations. 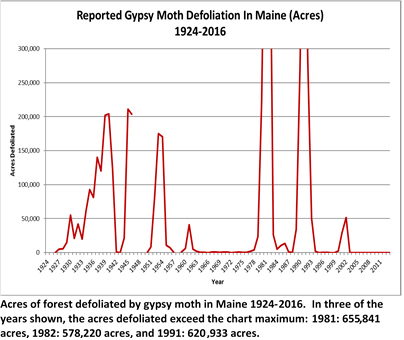 The last significant epidemic of gypsy moth in Maine lasted from 2000 through 2002. Approximately 51.5 thousand acres of forest were defoliated during the epidemic’s peak and final year. The gypsy moth is found from southern Aroostook County, throughout Penobscot County, central Piscataquis County, central Somerset County, northern Franklin and Oxford Counties and south in Maine. Parts of northern Maine are still free from gypsy moth, and movement of material from the infested area in Maine to other parts of the state and beyond is regulated by state and federal quarantines. Most healthy hardwoods can withstand one to several years of severe defoliation by the gypsy moth. However, white oak is very vulnerable to this pest and hemlock and pine can be killed in one season when 90 to 95% of the foliage is consumed. In hardwood stands, the understory and partially-shaded trees (weaker trees) are the first to be killed by repeated defoliation. Additional stressors, such as other defoliators, disease, and/or drought, can hasten decline and mortality of affected trees. When present in large numbers, the wandering caterpillars and their droppings can become a real nuisance in wooded residential and vacation areas. In addition, hairs from the caterpillars can cause an irritating rash in sensitive individuals. The favored host trees are oak, poplar and gray birch. The caterpillars will feed on most hardwoods except ash. After having fed initially on hardwoods they then become capable of feeding on all conifers except fir. Gypsy moth feeds on more than 300 host species in its introduced range. The eggs are laid in clusters, or egg masses, during late July and August. The egg masses, which are normally the size of a quarter and covered with buff-colored hairs, can be found at the base of trees, on the underside of branches, under loose bark, in crevices, under rocks or other debris on the ground. Egg masses contain from a few to several hundred or even over 1000 eggs, but usually average about 100 eggs per cluster. The eggs hatch in May, and most of the caterpillars mature by early July after reaching a length of about two inches. The gypsy moth caterpillars are hairy, generally dark brown to black in color, and have a small knob on each side behind the head (most distinct in small larvae). Fully grown larvae have five pairs of blue spots followed by six pairs of red spots in rows on their backs. As the caterpillars get larger, their consumption of foliage accelerates and trees may appear to be denuded "overnight," especially since they do most of their feeding during the night. At maturity, the caterpillars generally crawl to some protected spot, and pupate in naked reddish brown to brownish black pupal cases. Adult moths emerge about two weeks later to start a new cycle. Empty pupal cases and eggs are often found together. The female moth is of an off-white color with dark markings and with a wing span of about two inches, but it cannot fly so it tends to lay its eggs in sheltered places within crawling distance of the place where it emerged. The males are smaller and darker brown in color with black markings. Males are active fliers and frequently come to lights. Spread of infestations occurs mainly from wind dispersal of newly-hatched caterpillars. All stages of the gypsy moth can also be carried long distances on vehicles that travel through infested areas. Egg mass surveys conducted in the fall or winter can help predict the potential for significant defoliation the following year. Non-chemical: : Limited infestations can be alleviated during the fall and winter by scraping the egg clusters into a container and then destroying them. After egg-hatch and noticeable feeding, the caterpillars can be trapped and destroyed under a burlap skirt tied around the trunk of the tree; or the caterpillars can be contained by applying a band of tanglefoot around the trunk of infested trees to form a barrier to prevent them from wandering and becoming a nuisance around homes. Insecticides can also be applied to control the caterpillars (see B.). Chemical*: The home remedies described above may not be effective when host trees are plentiful. Forested areas can be treated by truck-mounted or aerial spray applications by a Maine Licensed Pesticide Applicator using a registered pesticide. Materials registered to control gypsy moth caterpillars in May and June include products with the following active ingredients: Bacillus thuringiensis var. 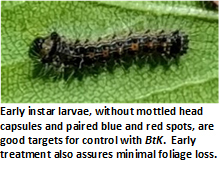 kurstaki (Btk), Btk should be applied before the larvae reach the 4th instar (gypsy moth caterpillars with mottled head capsule and distinctive red and blue pattern of spots are 4th instar or later and will not respond well to Btk treatments); Spinosad; and many others. Caution : For your own protection and that of the environment read the pesticide label and apply only in strict adherence to the directions and precautions.